Easy to use, Sock Puppets iPad app allows younger students to explore creative storytelling. With Sock Puppets for iPad, students can create puppet shows that review vocabulary, model behavior, relate history or science facts, express their feelings, or simply retells a story. Socket puppet shows help children develop language skills, imagination, problem solving, and creative thinking. Sock Puppets for iPad is an adorable app that lets you create sophisticated little sock-puppet shows . . . and it’s impossible not to have fun using it. There’s a free version and a paid version called Sock Puppets Complete that comes with additional content and longer recording time. Both are available in the App Store. 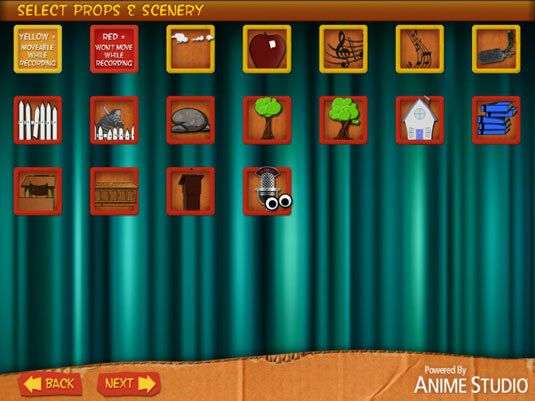 Create puppet shows by selecting puppets and positioning them on a stage with backgrounds and props. Tap the Record button and start talking. Tap one of the puppets, and it will lip-sync while also applying a cute little cartoonish effect to the audio of your voice. For students that want to tap their inner Spielberg, they can even develop the plot by switching backgrounds and moving their puppet extravaganzas to different locations. When a student is done, the show is converted to an entertaining little movie that they can watch and share with friends. Always try to structure activities with your educational goals in mind. 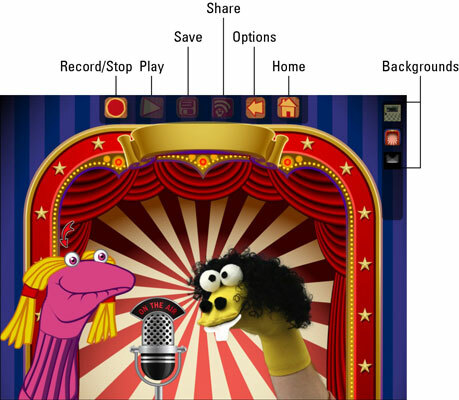 Integrate use of the Sock Puppets app into your lesson plans. Why settle for the same stale old vocabulary exercises every week when you can occasionally have children work together and use vocabulary lists in puppet shows? Be creative. Ask children to create and retell stories, review books, explain simple math or science concepts, act out appropriate behavior in social situations, and more. As always, remember to stress the importance of preparation before recording. Often, it’s the preparation time where most of the learning will take place. Tap the Sock Puppets icon on your iPad home page to start the app and then tap the New option on the opening-screen menu. This starts a new story. You’re presented with a row of puppet characters. Tap the puppets you’d like to cast in your movie (any amount you’d like), and tap the Next arrow (at the bottom of the screen). Note that you can purchase additional puppets, backgrounds, and props from the opening-menu screen. Select and tap the backgrounds of your choice, and then tap the Next arrow. This screen offers a selection of backgrounds to use as sets in your show. Remember that you can use more than one and switch between them during the show. Backgrounds sit behind your characters and cannot be moved. Tap the props and scenery of your choice, and they will be placed in your show; tap Next when you’re done. Now you’re ready to decorate your puppet sets with props, such as podiums and microphones, and scenery. Props with a red frame will be placed in a fixed position, and those that have a yellow frame can be moved wherever you’d like them. When you tap Next, the app sets up your stage, and you’re ready to start recording. Move your puppets and props into their positions. If you selected more than one background, you’ll see a strip with your background icons along the top-right corner of the screen. Tap any background to select it. Tap the round Record button on the top of your screen to start. Talking puppet: If you’ve selected more than one puppet, you’ll see one of them has a little arrow over its head. That means it’s the actively selected puppet, and as you start talking it will lip-sync to the sound of your voice. Tap any other puppet when you want it to become the active puppet. Moving puppets, props, and backgrounds: You can change the positions of puppets and props during your show by tapping and dragging them. Change the background and move your show to a new location by tapping any of the background icons on the strip at the top-right corner of your screen. Recording time: When you record, you’ll see a timer on the screen. It counts down from 30 seconds, which is the maximum length of the show. You can purchase an option for extended recording time in the App Store. Tap the Stop button when you’re finished. Tap the Play button to view your show. The first thing you’ll notice is that you sound like you’ve inhaled a mouthful of helium. That’s the cute little effect the app has applied to the voices in your movie. You can control the pitch of the effect in the Settings option on the home screen. The puppet show will play back with all the sound and movement that you recorded. Save your project by tapping the Disk icon on the top row. Share your show on Facebook or YouTube, or save it to your Photo library by tapping the Share icon. Sock Puppets currently allows sharing puppet shows only on YouTube and Facebook. Although you theoretically could create a private class account, such sites are blocked in many school districts. You’ll need to arrange the purchase of an additional in-app option that adds the capability to save video to the iPad Photo library. Many apps offer the choice of purchasing additional content and features from within the app itself. In the case of Sock Puppets, you can purchase items such as additional backgrounds and puppets, and additional recording ability (from 30 seconds to 90 seconds). Apps with in-app purchasing usually have a button that allows you to buy the additional options using your iTunes account. One important difference to note for educators is that apps can often be purchased through Apple’s Volume Purchasing Program (VPP) at an average 50 percent discount in larger quantities. At the moment, there isn’t any method for purchasing in-app options through the VPP at a discount; you pay the full fee per copy.